NOTE: We have recently updated our Even Up bottle but there has been no changes made to our formula. Vital ET™ is a trademark of Ashland Global Holdings, Inc. Mainstay of my morning routine. 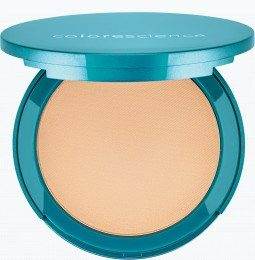 Colorescience products are the mainstay of my morning routine and it starts with this product. The color is a little off for me so I mix it with colorescience bronzer/primer. I do like even up. I got a sample from my dermatologist and m ready to buy it for myself. Immediately Even up covers discoloration while treating and protecting skin. Long term, the discoloration is gone! This is a nice product to use when I’m giving my skin a break from hydro quinine. I use it as a primer daily. Why on four stars? I wish it came in different shades. I darken it with Colorscience bronzer. I love this! I don't need anything else. It covers all the imperfections and make my skin looks amazing!! Love this product. I use it every day for a flawless finish or just for a sunblock. Even up has the greatest coverage and really helps minimize dark spots on the face. It has coverage and sun protection together! This gem is great for those with hard to cover red spots. Magic! I first discovered EvenUp at my dermatologist's office, when I was concerned about a small spot of discoloration on my cheek. I decided to try EvenUp instead of more invasive treatments, and I've been so thrilled with the results! While the coverage is a bit less than I initially anticipated, it gives your face a flawless appearance and can be worn alone or under makeup. This product delivers on its promises!! I love this product for post inflammatory redness. It's seriously the best. I have fair skin with pinks undertones and this turned my skin a little orange. I was given a free sample, which was great so I could try it prior to buying it. Sorry, but this product is not for me. I love Even Up! It has perfect coverage for me, so I don’t even have to use foundation. Love it! My favorite product! I love the coverage and it makes my skin really nice when wearing it. Amazing product! I've been using this for over a year. I don't wear foundation but this evens out my skin tone just like foundation. It's so light. My skin looks great after I apply it and I get the sun protection too. Great product! Will use for life. I bought this, along with several other Colorescience products, from my esthetician. I had high hopes for it, as I do have uneven skin tone with discoloration from old cystic acne. It looked great upon application, but within 20 minutes or so, it was just greasy. It made my face feel oily, and was clearly visible in any creases (under my bottom lip, under my eyes). I guess my skin type isn't right for this product, but I'm pretty bummed because I had high hopes based on the recommendations, and it because wasn't cheap. 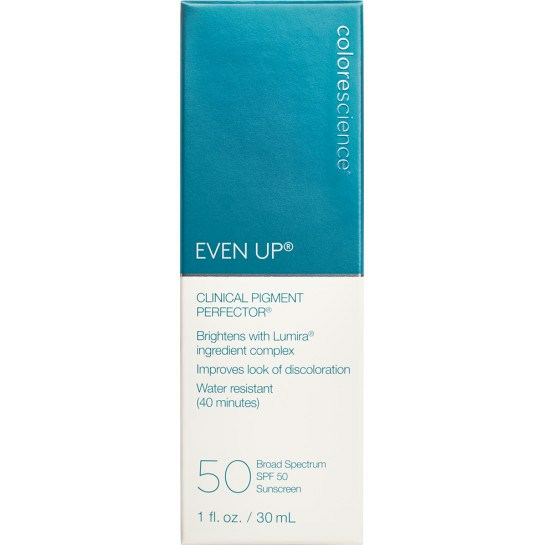 Even Up covers redness & hyperpigmentation! Even Up is incredible. It covers redness and hyperpigmentation. I have had melasma for years and it really helps with that. I love it! Tried out a sample and just love the look. It covered well and made a world of difference in my complexion. Even Up is true to its name! I use this everyday before applying my Colorescience pressed foundation/sunscreen. I apply one pump, smooth across my entire face and neck, and then apply my pressed foundation/sun-screen. 5 minutes tops!! Great coverage that feels weightless. I have used Colorescience for over a decade and continually have people comment on my healthy skin. Sun protection is key!! Thank you Colorescience!!! 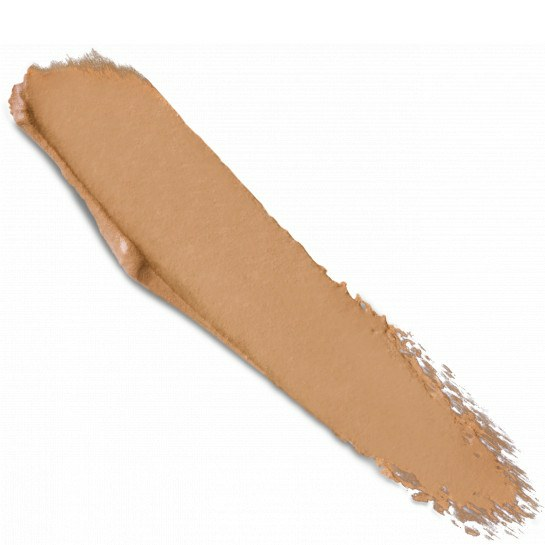 I have tried many foundations and this primer really covers up brown spots and blemishes. I always put some on before my foundation and my skin looks flawless. It can also be worn without foundation. I like how this product covers up my redness and gives me a more even skin tone. I received a sample from the dermatologist and it really is amazing. I barely have to use foundation after applying. I was not able to see benefits over time since I only used it for a few days. Only downside is the cost, which is why I haven’t purchased the full product yet. Still highly recommend! I love Even Up. It blurs my hyper-pigmentation so well that I am able to skip foundation. Even Up, Total Eye, and age defense over the top and I am good to go! This product has been an absolute game changer for me. I have a few small scars that are very difficult to cover without using a ton of product and this product does the best job evening my tone. I prefer to use minimal product for my daily routine and this is my go-to. I highly recommend it. I love the coverage and I think it makes my skin really beautiful when wearing it. However, my face has been getting greasy halfway through the day and I have fairly dry skin! Even Up works like a dream and it smells so lovely, too. I had a facial and this was used at the end. Amazing stuff. I want to order some but I was told they used a medium tint. How do I know what the tint color is? I have Hypopigmentation and nothing covers it, except Even Up!! My face looks so great with this product, and lasts all day!!!! Will not go without it. Somewhat pricey but great coverage. I absolutely LOVE this product! As a woman with Melasma, this not only gives me great coverage but also blocks me from the sun with its SPF 50. I will never use another foundation again. I love this product because it has great sun protection but also makes for a great base under makeup. I also love wearing it to the gym because it evens my complexion without being detectable on the skin. This product is fabulous! It creates such a flawless look and is also great sun protection. Nice coverage that evens up the look of my face. However, it seems to make my face a little bit more greasy halfway through the day. I do love how it feels though. This balances the color of my skin. It looks great even when I just put it on and go without finishing my makeup routine! I love the Even Up product! It makes my face look great! And so easy to put on. It lasts a long time also! I love this product and use Even Up every day! Great coverage, flawless application, and great for everyday use. I have also noticed brighter skin and a more even skin tone as well! Highly recommend!! This product is amazing. It's so expensive, but it honestly is worth every penny. I love that it protects, enhances, and sets my makeup - all in one! I just started using this product. I am in love with the Even Up. I will continue to use this. I have quite a bit of melasma on my face and this product helps to diffuse the discoloration under my foundation allowing me to use less foundation. My favorite way to use is under my osmosis pressed base powder. I can't speak to the effects of actually lightening my melasma because I haven't had it that long but so far I am very pleased with this product. Great product for uneven skin! It’s great coverage without feeling weighed down. Protect protect protect!! I love everything about this product. It stays put all day and the coverage is light and very natural looking. I have bad melasma and it really helps conceal my brown spots nicely. I can't be with out this. You don't need a lot of product. Highly recommend to anyone with Melasma. My skin tone is fair/light and this color works perfect. I love that Even Up masks my uneven skin tone while helping to protect and improve pigment! After using this product for several months, I still have product - a little goes a long way. My skin has a more even toned and it even covered post surgery bruising. Very Happy With Even Up! I love the way Even up truly evens the tone of my skin! Perfect for everyday and it looks natural. A must have! It's a little thick but works great when I mix it with either my moisturizer or the Coloresience Face sunscreen. It does what it say....even out your skin tone! I have mild rosacea and have never been a fan of using foundations or anything that feels heavy on my skin. I’ve been using Even Up for the last year (I’m on my 3rd bottle) and love that I get flawless coverage, it doesn’t look or feel like I’m wearing anything and there’s the bonus of sun protection plus other great ingredients for my skin. I was unsure about this stuff at first but I am seeing a difference in my skin and it feels great on my skin. It is not too dark for my very pale skin color either. I would recommend to others. This is very pricey but so worth it. It really helps hid imperfections and provides a great base for the mineral powder. And it's really effective at protecting your skin from sun damage. I use it every single day. It lasts a long time. I use it everyday whether or not I'm wearing makeup. It's an extra barrier of sun protection. Hides imperfections. This is my go-to makeup! I am 43 with acne-prone skin and melasma. My intention was to try Even Up as a primer, but it works so well and feels so good, it is the only makeup I wear. No foundation, no powder. 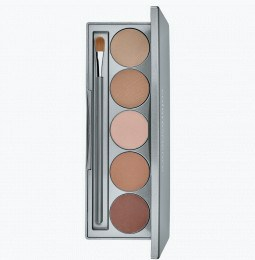 Only the Colorescience concealer palate when I need it, and a little eye makeup. Even Up is, by far, the best makeup product I've ever tried. I received a sample and really enjoyed it. Will buy. Got this in a sample and will definitely order the full size! It is amazing! This product is thick, but blends nicely with excellent sun protection. I use daily under foundation to help diffuse major hyperpigmentation caused from a laser. 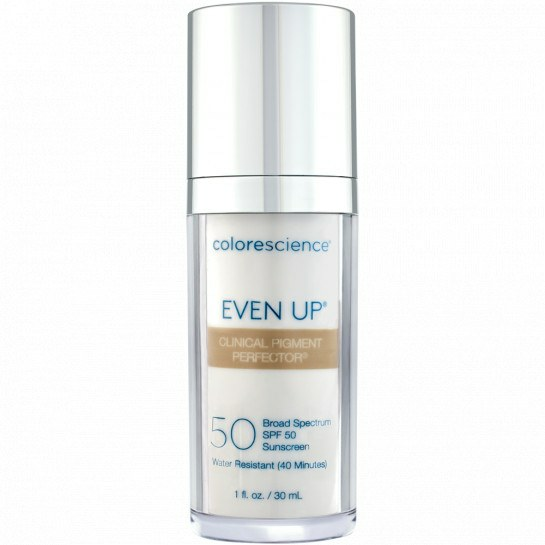 Even Up is amazing for hyperpigmentation coverage! Even Up is the best product for hyperpigmentation and dark spots. I absolutely love it! Covers all my dark spots well and evens out my skin tone. A little goes a long way with this product. This is one reason I enjoy using Colorscience products. I know they will work and that they will last. Thank you!!! Does exactly as it says! I love love this product...its a must have for a great look. Even up evens out my complexion! Just starting using Even Up and I really find that it helps even out my complexion and makes my age spots less noticeable. It is a thick product and I find that if I rub it between my fingers to break the product down before applying, it's easier to apply. The only negative about this product is the price. I'm obsessed with this product! I use it religiously every day and it really does an amazing job at evening out my skin (and helping my makeup stay on all day long). I love that I'm not only treating my brown spots but also preventing future damage with the SPF 50. 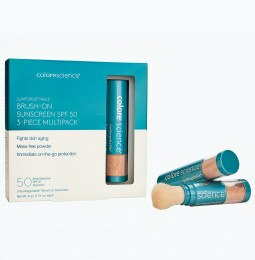 This is my favorite Colorescience product! This is the very first product I ever used from Colorescience and this is the one that got me hooked on the whole line of Colorescience. I love this product. It is smooth and covers any age spots, sun damage,and imperfections. I cant believe I lived without this for so long! And I love the 50 SPF. I just wish, it came in another color tone better suited to pink undertones. We burn easily! It’s expensive, and I’ll probably end up passing this on to someone with a better color match. This product is amazing-except the smell. If you can get past the smell then this is a great product. It truly evens out my pigment, a lot goes a long way. Just like all colorescience products it works great and is silky smooth. A lot goes a long way-- haven't had to buy any in months. Feels so light on my skin. I received samples and the products works well. Got a sample - will definitely purchase! I live in a high altitude environment with a lot of sun exposure and winter elements. This product has protected and perfected the skin of my face and I have recommended this product to all my friends. The consistency of this product and the way it goes on my skin is silky smooth. A little goes a long way. I will buy again. It feels so light! It brightens your skin right away. A little bit goes a long way. By itself, it’s too heavy and thick for me so I mix a small amount with my facial moisturizer in the palm of my hand and it’s light yet covers my imperfections. Love the product. Finally a product that does what it actually claims! I wear it for foundation. Covers my melasma perfectly! Thank you Colorescience! Probably one of the best products I've bought for everyday use. It's the only thing I put on my face now....no foundation, no powder. 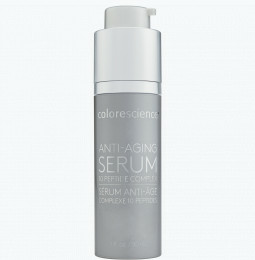 Softens all of the 'age spots' I have from the sun, keeps the nasty UVs from causing more damage and moisturizes a bit. It gives me an even tone without looking like I've piled on the foundation. I still use a moisturizer before I put it on because I have very dry skin. I have used Even Up for 2 months and this product really works! It blurs existing issues while treating them. I have seen an 80% reduction already. Within the first couple weeks of using Even Up I noticed less blemishes and my dark spots are beginning to fade. Seriously impressed with the light, smooth feel and how it glides onto skin. The coverage is down right glowing perfection. My new must-have favorite!! Too heavy. I felt suffocated. As a base or a light cover, it works! Love the versatility of this product. Whether using it alone on a makeup free day, I feel protected and have a lovely even tone. Under foundation, it makes my base stay all day! Winner! !